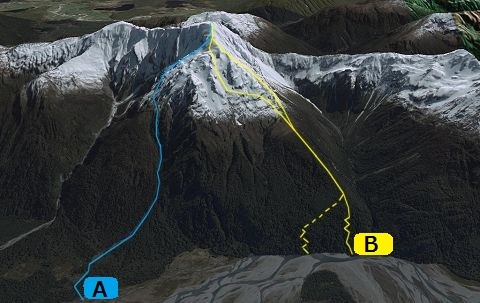 There is no easy way to approach this ridge, the full flow of the Taramakau River (includes the Otira River) must be crossed in one or two channels, then a west coast scrub bash ensues to gain the upper ridge, from either the true right spur adjacent the creek draining the Mt Howe basin, or an obvious diagonal fault scarp about 200m further downstream. Either way there tends to be some steep, slippery terrain hidden in the beech forest. Once treeline is reached travel along the wide open ridge is easy. Steepening rock is encountered about 300m short of the summit, in winter the snow/ice allows fairly easy travel (beware of cornices! ), in summer expect loose, gruddy rock. An alternative is to track west under the ridge rocks using a series of interlinked scree/snow gullies that lead to the summit, this makes an easier descent route (take care in winter as these are also avalanche paths).